Yesterday, I woke up and saw the general election results. 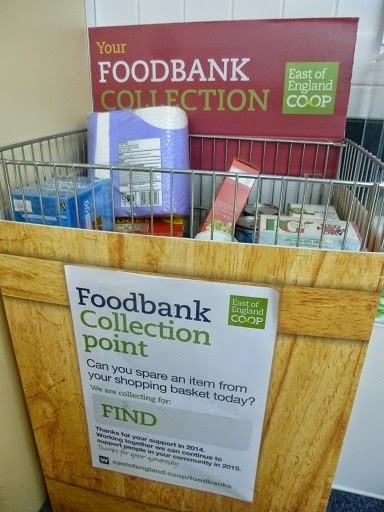 After dropping my children at school, the first thing I did was to go to our local Co-op, buy some food and put it in the collection box for our nearest food bank. I fear it will be needed. Food bank collection point – add to it if you can..
With plans for further benefit cuts and the roll out of Universal Credit, the queues at food banks will only get longer. The appalling rise in demand for food banks was one of the major reasons I got involved in the Live Below the Line campaign two years ago, feeding myself on £1 a day for 5 days to raise funds and awareness about poverty. I desperately wanted to do something (however small) to help the 1.2 billion people worldwide living in extreme, unimaginable poverty. Closer to home, I was shocked that in 2012/13 almost 350,000 people in crisis were given three days’ emergency food by Trussell Trust food banks. The UK is one of the richest nations in the world – how was it possible that so many people were going hungry? Today, I find it even more horrifying that visits to food banks have more than TRIPLED. During the last year, nearly 1,085,000 people have received three days’ emergency food from the Trussell Trust. Let’s not forget, you can’t just rock up at a food bank because you fancy a freebie. You have to be referred by a “frontline care professional” like a doctor, social worker, teacher or health visitor. Someone else has to recognisethat your circumstances are so serious that you and your family will go hungry without an emergency food package. The triple whammy of the economic downturn, rising food prices and benefit changes has hit many people hard, and left them struggling to feed themselves. When you’re on a low income, reduced workinghours and unexpected bills can cause a crisis. Don’t assume behind a computer, in the comfort of your own home, that it couldn’t happen to you. Redundancy, unemployment, accident, illness or family circumstances can devastate family finances without warning. Nearly a third of households have so little savings that they would not be able to pay their mortgage if they lost their job, according to research by HSBC, the bank. Trussell Trust Chief Executive David McAuley described many people as “living on a financial knife edge” where “one small change in circumstances or a ‘life shock’ can force them into a crisis where they cannot afford to eat”. Don’t assume that state benefits would scoop you up in a safety net. Nearly half of referrals to Trussell Trust foodbanks (44%) are due to benefit delays or benefit changes. The UK’s Faculty of Health has raised concerns that “the welfare system is increasingly failing to provide a robust last line of defence against hunger”. With austerity measures, benefit cuts and sanctions proposed by the new Government, the problem is only likely to get worse. So yesterday, I put some extra items to my shopping basket, and added them to the food bank collection point. It was only a tenner, but it might help stop someone, somewhere, going to bed hungry. Next Post Live Below the Line: poverty tourism or worthy cause? I try and do this every week when I shop. I get the Trussell Trusts newsletter into my inbox every month and it makes for depressing and worrying reading. It was one reason why I spent the money I would normally have spent on food for me during LBTL week on shopping for the food bank. It's the least we can do isn't it, in so many ways we are so lucky. Yes. LBTL never ceases to make me incredibly grateful for all that I have.